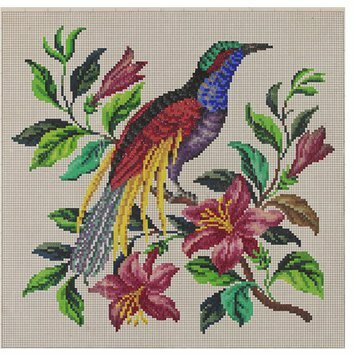 This is a square coloured grid embroidery design of a bird of paradise on a branch for Berlin wool work. Berlin wool work is embroidery with Berlin wools or any type of thread or beads on canvas by means of copying a coloured chart known as a Berlin pattern. Almost exclusively confined to the 19th century, Berlin wool derived its name from the wool that came from Merino sheep in Saxony. It was taken to Gotha to be spun and on to Berlin to be dyed. The production of this wool was discontinued in the 1930s. Prior to the introduction of Berlin patterns it was very rare to find any indication about the choice of colour or threads. Berlin patterns were always coloured by hand at first, until the emergence of industrial printing techniques. The names of a few Berlin pattern makers are often seen on examples such as here with Hertz and Wegener. Others include L.W.Wittich, Carl F.W.Wicht, A.Todt and G.E.Falbe. Unfortunately no records remain about these printers and hence very little is known about them.